In their predictions for 2017, IDC forecasts that investment in digital transformation initiatives will reach $2.2 trillion by 2019 which is up by 60% from this past year. The partner opportunity to capitalize on that trend is huge. But without the sales strategy and knowledge to support that initiative, it can be difficult to make the most of this moment. To provide insight into the art and science that is sales success, I recently interviewed Ron Karr, the best-selling author of Lead, Sell or Get out of the Way. Ron has helped Microsoft partners better understand customer buying psychology and how this leads to sales growth for a number of years. Hopefully his advice will help you capitalize on the industry momentum and grow your business. To set the stage for partners looking to improve their sales strategy, I asked Ron to share with us his formula for success. While he is a salesperson at heart, his advice is relevant for sales, marketing, and management professionals alike, so even if you are not a salesperson per se, his perspective is valuable. Ron said that the key elements of that success are: Mindset, Insight, Motivation, and Velocity. 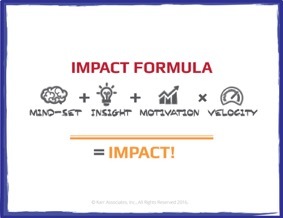 To understand the components of this formula in detail, I asked him to share what he meant by Mindset, or how our thinking about an end result, really impacts that result. Ron explained that a critical aspect of the relationship you want to visualize with your customer is actually leading them through an acquisition process. Next I asked him to explain his views on insight, and how it can help in focusing on your customer needs. Do your actions support your purpose? Another important ingredient is motivation, or understanding the level of desire that a consumer has in the buying process. “To gain even greater context, as discussed earlier, raise your conversation beyond products to the enterprise level. Uncover the outcomes they are looking to achieve as an organization, and then present your how in context to the enterprise. This will greatly elevate your perceived value,” he concluded. Lastly I asked him to explain how to gain velocity with the type of thinking we had already discussed. Thank you to Ron Karr for sharing his insights with us. To learn more about his bestselling book Lead, Sell or Get Out of the Way, For more information please go to www.ronkarr.com. How do you ensure that your sales team has the formula for success with customers? Share your tips in the comments below.